First off, it’s pretty easy to make, and imparts feelings of skill and achievement on the maker that are disproportionate to the work. Secondly, fresh ricotta tastes fabulous, and making it is the best way to taste it as fresh as it comes. 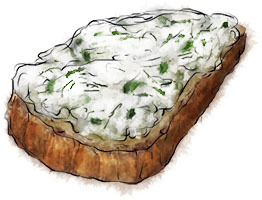 I’m thinking spring salads of ricotta, purple basil, watercress and hazelnuts, drizzled with olive oil and lemon, or crunchy toasts spread with ricotta mixed with fresh parsley and dill, or even with smoked salmon. Think how it would pep up a tray of roasted tomatoes, or how good it would be for breakfast topped with honey and slivered almonds. How bright and fresh and full of spring it would taste. Thirdly, some cooking is just there for pleasure. We do it because we enjoy the process of creating, making, pottering. It’s inherently satisfying to be able to say “I made that”. I’m not suggesting that we should get cheese making out of necessity, but rather out of adventure, a spirit of play, because it’s fun. This entry was posted in The Monday Treat and tagged cheese, cream, lemon, ricotta, spring. Bookmark the permalink.